This two bedroom, two-bath, Non-Smoking condo is conveniently located for a fun-filled vacation. A smartly decorated unit with all the amenities to make your vacation one to remember. Our 2nd floor location (unit D206) has been upgraded with all new appliances, granite counter tops and tile floors. The second bedroom bath has been remodeled into an open walk in shower as seen in the photos. It sleeps up to six guests. There is a king bed in the master bedroom, two twin beds in the second bedroom and a sleeper sofa in the living room. It is equipped with a large capacity washer and dryer, central air conditioning, a flat screen TV in the living room and the master bedroom. Thanks to my wife the kitchen has everything needed (all the nuts and bolts) for good cooking. For those who have their computer with them for pleasure or work there is high-speed wireless internet available in the unit. There are ample linens and towels in unit. The unit is also equipped with two unseen amenities those being comfort and relaxation. The view from the lanai is spectacular. There is private parking and a security gate on the property. This unit is located across the street from the Hilton Waikoloa Village, Marriott Hotel, for golfers its next to the Beach Course and a three minute drive to the Kings Course. The Unit is a short walking distance is (ABAY) Anaehoomalu Bay. The Bay lends itself for the best in water sports you name the water sport and it there. Within walking distance are the King Shops and the Queens Market Place offering a variety of shops and a variety of fine restaurants for your shopping and dining pleasure. The Hilton Waikoloa Village and the Marriott have some of the finest five star restaurants on the island. A favorite activities is to swimming with the dolphins at the Hilton, and visiting the wonderful beach north of the condo. Check the other activities at the bottom of this page for more things to do. VIEW THE CALENDAR ON VRBO LISTING #28428 FOR 2018/2019 AVAILABILITY IN OUR OTHER CONDO. I'm and accountant with my practice in Southern California. I travel back and forth to Hawaii and work on line when I'm in Hawaii. There are so many benefits to this and our other condo. These benefits run from the great tropical winds that blow daily to the wonderful beaches within a short driving time, the many golf courses, the water sports, the helicopter flights, the hiking and the two hotels the Hilton and the Marriott cap off with great shopping and dining a short walk away. There are many more benefits to numerous to mention.The Big Island is a vacation must. There several beaches just minutes away. Some of the best sandy beaches on are here on the Kohala Coast. The town of Kona is 30 minutes from the Beach Resort. There is a variety of shop, restaurants along with places of interest. The Waikoloa Beach Resort is the fastest growing vacation area on the Kohala Coast. You have no view of the Golf Courses but your next door to the Beach Course and a few minutes from the King's Course. From the Lanai you have the most beautiful of the Big Island Mountains. Access to the easiest vacation! This VRBO is located in a great part of the Waikoloa beach area. The unit has basic items as well as towels, a few beach chairs and coolers to borrow for a beach day at A bay. 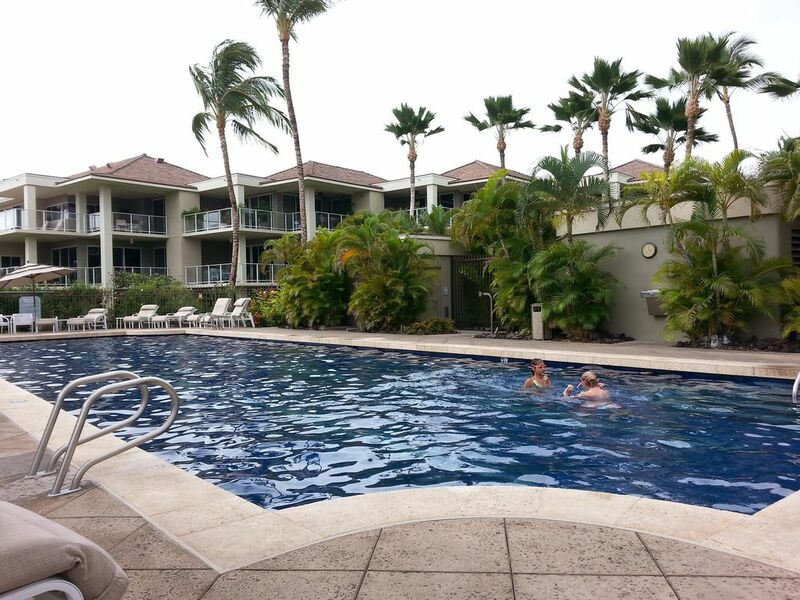 This is our second visit to the Big Island during the holidays and we were really happy to have a quick walk to the hotels as well as the malls located there versus at another property we have stayed at previously. My biggest piece of advice would be to contact Lora if you have something special in mind. We were able to connect prior and it really was a nice benefit to working together while we stayed at the property and I needed something. Creating Christmas from luggage isn't easy and I appreciated their help with making my holidays sweeter for my family. The property is the perfect location. Great pool & gym. Quiet and spacious. We enjoyed our month long stay. The beds were comfortable, and the decor was pleasant. The location is very convenient, secure and private. We purchased a fruit and vegetable juicer while we were there. I hope others enjoy fresh juice while visiting and we will when we return again. Can't wait to come back. Thanks for sharing your paradise with us. Great condo, well equipped and super comfortable. Will return because it truly is a home away from home. Thank you. It was a pleasure having you as our guest. We have never stayed in such a large & comfy condo. Grounds are well manicured & pool & spa areas are emaculent. Owner Leroy is very easy to deal with....now if "Homeaway" would just do their job properly ie: relaying the right codes & info everything would have been "hunky dorey "
James Thank You for the review. Yes you are right on it "If Homeaway would do their job it would be much better for all concerned. They are only interested one thing and that's $$$$$$. Since they changed over I have spoken to many owner who are very unhappy just as I am. I've tried to get them to correct their the error that gives the guest the incorrect codes needed to excess the unit, pool and the internet. I have had no response from Homeaway. I bet I will heard from them when I subscription runs out. My husband and I enjoyed our stay in D206. The condo had everything we needed and then some. This had to be one of the better equipped places we have stayed. The beach equipment was better than most. The condo itself had plenty of everything and was very clean with a comfortable bed and furnishings. The view from the balcony was beautiful. We enjoyed watching the sunsets from there. The condo complex had a great workout facility that my husband used every day of our stay. We liked The Tropics Ale House, which was a short walk from complex. We would definitely stay there again! enjoyed the Big Island I did on my first visit. Looking forward to having you as our guest again. Well equipped condo even w/ beach chairs, coolers etc.. Truly a good home away from home. Listing description was accurate. Great location close to beaches, markets, restaurants. Well maintained grounds w/ beautiful flowers and flowering trees. Good supermarket in Waikoloa Village if you want to cook. No need to spend time and effort going to Costco. Thank you for your review. I'm sure that future guest will find your comments very helpful. Fly over the rainforest & see the many water falls or fly along the coast or to the volcano in a helicopter, A camera is a must on this trip, Across the street from the condo are the Marriott Hotel & the Hilton Waikoloa Village, The lulu at either hotel is one of the best on the island, If your not in the mood for a lulu then enjoy one of the five star restaurants at the Hilton Waikoloa or if shopping is your thing visit their many fine shops & galleries, Diving is favorite! A large variety of tropical fish & the green turtles await you, If you find the right beach the only person diving will be you, Horseback ride to the waterfalls, the rainforests & ride along the river, The residents that live here will welcome you, The Black San Beach, The children's zoo is a real must to see when visiting Hilo. The variety of wildlife will amaze you, With the many great courses Golfing a must for golfers. The ALOHA of Hawaii awaits you! MONTHLY RATES APPLY TO RESERVATIONS OF 30 DAYS OR MORE. VIEW OUR OTHER CONDO AT VRBO LISTING. VIEW LISTING 28428 FOR AVAILABILITY.